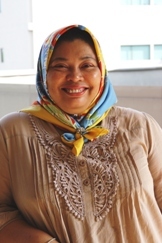 Ms Aniza joined the Department of Accounting and Finance, Monash University Sunway Campus in March 1999. Prior to this, she has taught at Universiti Utara Malaysia. Zainol, A. & Nair, M. (2006), “R & D reporting practice of public listed companies in Malaysia: a PROBIT analysis”, Global Business and Technology Association 2006, Moscow , Russia. Authorised by: Marketing and Future Students. Maintained by: Monash University Malaysia Webmaster Team. Last updated: 14 Feb 2019.